If you have ever experienced scabs in nose or a sore in your nose, you know how tender this delicate area can be with any affliction. Causes of scabs in nose can include internal and external factors such as allergies and the weather. Dried mucus can be mistaken for a scab, which is normally more painful and harder to get rid of. To know the difference, we will learn more about the underlying causes. Scabs in nose treatment takes time, and may involve a simple change in habits and lifestyle. A scab anywhere on the body is a cluster of hardened cells or a dried blood clot that forms to cover and protect an open wound or sore. This process begins as blood platelets form a clot to stop the bleeding and prevent other fluids from seeping out. As the clot dries, it turns into a hard crust known as a scab. These dark red or brown scabs act as protective shields for the new skin cells that develop within, and repair any trauma to the blood vessels. Scabs in nose can occur to anyone at any time with the right conditions. Our nose is lined with soft tissue that can easily be damaged by the slightest action, such as blowing the nose. A scab may form with inflammation of the nasal lining. This is seen with allergy and hay fever conditions. You could also experience itchy, watery eyes and a runny nose. Sinusitis is the swelling and inflammation of the sinus cavities. These cavities sit at your cheekbones, lower forehead, between the eyes, and in the bones behind the nose. Normally, the sinus cavities are filled with air, but they can become inflamed and fill with fluid and possibly harmful bacteria. This causes bleeding, and eventually scabs will form. Sinusitis is caused by allergies and respiratory infections. When the interior or exterior of the nose is hit, scratched, or rubbed too harshly, a scab can be the result. One form of trauma is nose picking. 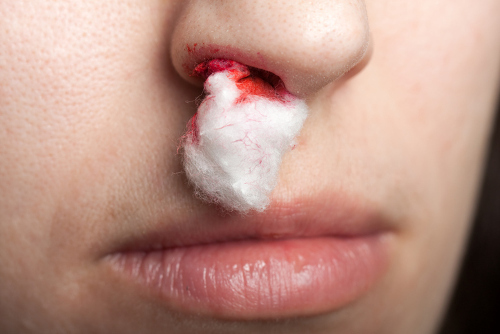 By pulling on the lining, you can create a sore or wound, and bleeding scabs in nose can occur. This can be a never-ending battle, as nose picking leads to scabs and nose scabs often leading to nose picking. Scabs in nose form to protect a sore and keep infections of any sort from invading an open wound. This can happen to nose piercings if they become infected as the seeping fluid hardens. The bacterial infection known as impetigo is a common childhood infection. These yellow, crusted scabs are seen in and around the nose and mouth. The same thing happens with cold sores despite the viral infection commonly thought to affect only the mouth. Other serious infectious diseases resulting in nose scabs are the herpes simplex virus and the human immunodeficiency virus (HIV). The air we breathe and the change in weather patterns can have a severe effect on the nasal passages. Dry, cold air or temperatures can cause the lining to crack while the hot, humid heat and air can cause the same effect for some people. Tiny sores can open in the nose and scab over. Itchiness or the habit of nose picking can worsen the condition once the scab is removed. Both illegal and prescribed drugs can cause scabs to form in the nose due to irritation. Sniffing cocaine or other drugs damages the lining, and excessive use of nasal sprays can dry out the lining. Any scabs or crusts that refuse to heal and leave can be a sign of nasal cancer. Lasting scabs are commonly seen with persistent nosebleeds, sinus pressure, facial numbness or tingling, a runny nose, and ear pain. If scabs in the nose are caused by infections or a severe allergic reaction, topical medications may be required. In addition to these methods, home remedies and natural treatments may be used for these and minor cases. We will look at how to heal scabs in nose. Be aware of any recent injury or damage to the nose, especially the inner lining. You should always gently cleanse any sores to prevent infection. Allow the wound to heal on its own. Avoid touching the scab and general nose-picking as you can easily cause any existing sores to worsen and even spread. Constant picking at an irritation can hinder the healing process. You can heal the dryness that leads to scabs, as well as the scabs themselves, by applying a gentle moisturizer to the affected area. Inside the nose, dab “Vaseline” on the area with a cotton swab to prevent a hard, crusty scab from forming. The affected area will still heal on its own. Whether you smoke or are around second-hand smoke, the smoke itself from tobacco can cause inflammation of the nasal passages. This causes a high risk for bacteria. With a stuffy nose, you will be tempted to continue blowing and maybe blowing hard, to get rid of the mucus and harden crusts. This force can cause bleeding and inflammation, both of which lead to scabbing. Persistent or frequent nose scabs may require the use of a humidifier at bedtime. The humidifier will help lubricate the nasal passages and possibly loosen up dried scabs. Look around your house for natural home remedies. Use a warm compress to treat an inflamed nasal lining. You can also wash the affected regions with a solution of baking soda and apple cider vinegar. Scabs in nose can cause discomfort and pain, as they may not fully heal before the cycle of scabbing begins again. Ordinary scratching of the nose, or blowing of a stuffy nose, can lead to irritation and bleeding, which then leads to nose scabs. The nasal passages are lined with fragile tissue that deserves gentle care. This is true with external factors that can damage the tissue, such as dry air and smoke. Most scabs can be treated with natural home remedies, while more severe cases may require a form of antibiotics. Be aware of your surroundings and break any bad nose-related habits, such as nose-picking. “What Causing Scabs In My Nose?” Healthline; http://www.healthline.com/health/scabs-in-nose#overview1, last accessed July 19, 2017. “Scabs In Nose Causes, Why Some Are Stubborn, How To Remove Nose Scabs,” Health Know Facts http://health.knowfacts.org/nose/scabs-in-nose-causes-pictures-that-wont-heal-how-to-treat-nose-scabs/, last accessed July 19, 2017. “Scabs In Nose Causes, How to Get Rid of Painful Yellow Nasal Scab that Won’t Go Away,” Treat Cure Fast; http://www.treatcurefast.com/nose/scabs-in-nose/scabs-in-nose-wont-heal-painful-bloody-white-treat-get-rid-scabs-inside-nose/, last accessed July 19, 2017.